Do you feel like all your friends are 'getting old and boring', but you are getting younger by the day? Can you be heard saying the phrase '40 is the new 20'? Is your wardrobe on-trend, but for the second time round? It's official, you're in denial. You are middle-aged! You Know You're Middle-Aged When... is a hilarious collection of stories, anecdotes and quotes about other people's mid-life crises, along with tips on how to spot the telltale signs that youth is no longer on your side. Chapters include, You know you're middle aged-when: • You're Too Old to Party • It's Time to Dress Your Age; • You Feel the Need for Speed; • You Hit the Big 4-0. Entertaining and engaging, this book is guaranteed to have any old codger laughing out loud about their own descent into the twilight years. 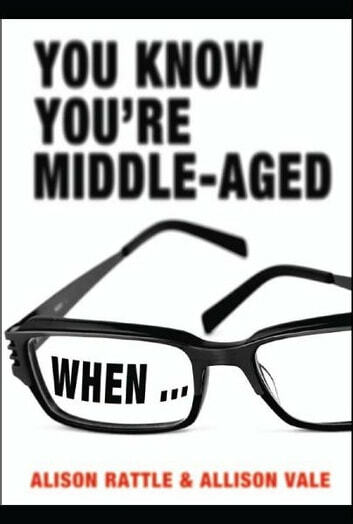 I read this book thinking it would give me some tips on how to handle my upcoming middle age and was surprised to see that they consider 30 as being the beginning of this era, at 47 I'm considering entering my middle age some time in the next ten years although I have shown many of the signs in the book since birth. Very funny book, loved it.